One mildly controversial topic in our industry is whether to provide employee stock options broadly within a tech company. Mind you, this isn’t very controversial in VC-funded companies. The only discussion in that environment is how much and to who – not whether or not. But VC-backed companies represent only a tiny fraction of the total universe of tech companies. Even though providing equity compensation to employees is much more common in tech businesses than in the overall business universe, I find that even within the tech community interest in employee equity participation drops off dramatically outside of the VC ecosystem. I’ve seen entry level admin assistants with small amounts of employee stock options (a few hundred shares vesting over a number of years) feel and act like a major part of the team, willing to go the extra mile. In my experience, teams that feel that they have a big payoff with a successful exit are much more highly motivated than those that don’t. Even small amounts of options can cause employees to act like owners. I guess this is really the crux of the argument. I’ve met some very intelligent people that don’t believe it. Recently I came across a PhD running a very successful company that didn’t believe offering equity to employees ” was the best way to align them with his goals” for the company. It baffles me, honestly. I don’t understand how making everyone feel like an owner DOESN’T best align them with the goals of the majority owners of the business. Maybe I just have too strong an opinion on this topic to do a good job of seeing the other side of the argument. But I really believe that this position of keeping the equity exclusive to one or just a few – although it may be one that is held sincerely – is really a self-delusion by someone that really just doesn’t want to share the wealth. We’re all capitalists and I don’t begrudge anyone – especially a risk-taking entrepreneur – who is attempting to maximize their own return. But I really believe that in this case it’s being penny wise and pound foolish. It comes down to whether you believe that being treated like an owner causes someone to act like an owner. Imo, NO ONE is better for a business than an owner. 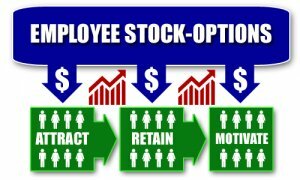 It is true that offering options to every employee doesn’t have the same effect on EVERY individual. But I firmly believe that in aggregate you will likely get the “act like an owner” effect that is so desirable. Also, by using options vesting over a period of years as the equity participation platform those folks that leave (either willingly or because that are terminated) will have an minimal impact on your ownership pool. One of the main reasons (at least for early stage software & hardware companies) to offer broad equity participation via employee stock options is that it’s one of the few areas where you can compete with larger, more established companies for the best employees. Startups generally can’t offer the stability, high salaries, or the best benefits that major corporations can. You’re selling the dream of upstart victory against the odds. — the dream fruits of that victory for an employee are an exit event with startup equity options. As I alluded to earlier, what is often misunderstood by those in position to pass out startup equity options is how even a modest amount of participation can change attitudes from bureaucratic to entrepreneurial. Small amounts of equity can have a huge leverage effect, changing a culture from “me-first” to “we-first”. It’s important to keep in mind that you still need to hire that right kind of people for your entrepreneurial environment. People that are risk-adverse or bureaucratic by nature are likely not good fits and won’t get the full motivational boost intended by employee stock options. So you need to hire the right personality profile AND motivate them properly to maximize the effect of using startup equity as a major tool in your compensation bag. Way back when at HP we had small amounts of employee equity options for select people (not just high level managers), a discounted stock purchase program and profit sharing. All of these small steps combined to drive great employee loyalty and caused a high percentage (including me) to feel like and act like an owner. This is a VERY difficult effect to achieve in a huge corporation such as HP was even at that time. In combination with a bottoms up decision-making approach, equity participation provided great leverage compared to other large competitors that had the typically bloated, bureaucratic stereotype parodied in Dilbert cartoons that is close to reality in many cases. The ability to keep a small company culture for as long as possible is highly desirable in my view, and equity participation can play a substantial role in this. Done correctly, it may be the best employee retention tactic of any possible benefit and will increase loyalty and reduce churn. If structured correctly, employees will feel like that need to stick around at least for another year of equity payoff – and every year thereafter. This part of my argument may not resonate with some, but I really believe that the belief that there is “fairness” is paramount in achieving a healthy culture in ANY organization. In an era where the pay gap between the CEO and the lowest paid employee in companies is the greatest of all time, I believe that the perception of fairness is all the more important. Please don’t misunderstand, by fairness I don’t mean “equal”. Everyone contributes at a different level and it’s only fair if those contributions are rewarded differently. But imo, if a CEO or an executive team is getting wealthy from stock options while their hard-working, modestly compensated staff doesn’t participate in that upside AT ALL–well, that doesn’t pass my basic fairness test. And I’ll bet it won’t pass the fairness test of the great majority within the organization. This can have a very CORROSIVE effect on a company culture and ultimately lead to performance regression which hurts growth and profitability. A popular sayings come to mind: “Pigs get fat, Hogs get slaughtered”. So that’s my very one-sided take on why every tech company should offer employee stock options EVERY team member. Many will agree, but there are also quite a few senior tech executives who won’t. Post a comment below with your own attitudes and experiences on equity participation.